Radioembolization (RE) with Yttrium-90 ( 90 Y) microspheres is an effective treatment for unresectable liver tumors. The activity of the microspheres to be administered should be calculated based on the type of microspheres. Technetium-99m macroaggregated albumin ( 99m Tc-MAA) single photon emission computed tomography/computed tomography (SPECT/CT) is a reliable assessment before RE to ensure the safe delivery of microspheres into the target. 90 Y bremsstrahlung SPECT imaging as a posttherapeutic assessment approach enables the reliable determination of absorbed dose, which is indispensable for the verification of treatment efficacy. This article intends to provide a review of the methods of optimizing 90 Y bremsstrahlung SPECT imaging to improve the treatment efficacy of liver tumor RE using 90 Y microspheres. The aim of this study is to assess the effectiveness of Radiosynovectomy (RSV) using 177 Lu-labeled hydroxyapatite ( 177 Lu-HA) in the treatment of painful synovitis and recurrent joint effusion of knee joints in rheumatoid arthritis (RA). Ten patients, diagnosed with RA and suffering from chronic painful resistant synovitis of the knee joints were referred for RSV. The joints were treated with 333 ± 46 MBq of 177 Lu-HA particles administered intra-articularly. Monitoring of activity distribution was performed by static imaging of knee joint and whole-body gamma imaging. The patients were evaluated clinically before RSV and at 6 months after the treatment by considering the pain improvement from baseline values in terms of a 100-point visual analog scale (VAS), the improvement of knee flexibility and the pain remission during the night. RSV response was classified as poor (VAS < 25), fair (VAS ≥ 25-50), good (VAS ≥ 50-75) and excellent (VAS ≥ 75), with excellent and good results considered to be success, while fair and poor as failure and also by range of motion. Three phase bone scan (BS) was repeated after 6 months and changes in the second phase of BS3 were assessed visually, using a four-degree scale and in the third phase, semiquantitatively with J/B ratio to see the response. Biochemical analysis of C-reactive protein (CRP) and fibrinogen was repeated after 48 h, 4 and 24 weeks. In all 10 patients, no leakage of administered activity to nontarget organs was visible in the whole-body scan. Static scans of the joint at 1 month revealed complete retention of 177 Lu-HA in the joints. All patients showed decreased joint swelling and pains, resulting in increased joint motion after 6 months. The percentage of VAS improvement from baseline values was 79.5 ± 20.0% 6 months after RS and found to be significantly related to patients' age (P = 0.01) and duration of the disease (P = 0.03). Knees with Steinbrocker's Grades 0 and I responded better than those with more advanced changes (Steinbrocker's Grades III and IV) in terms of VAS improvement (75% vs. 45.8%) (P < 0.001). 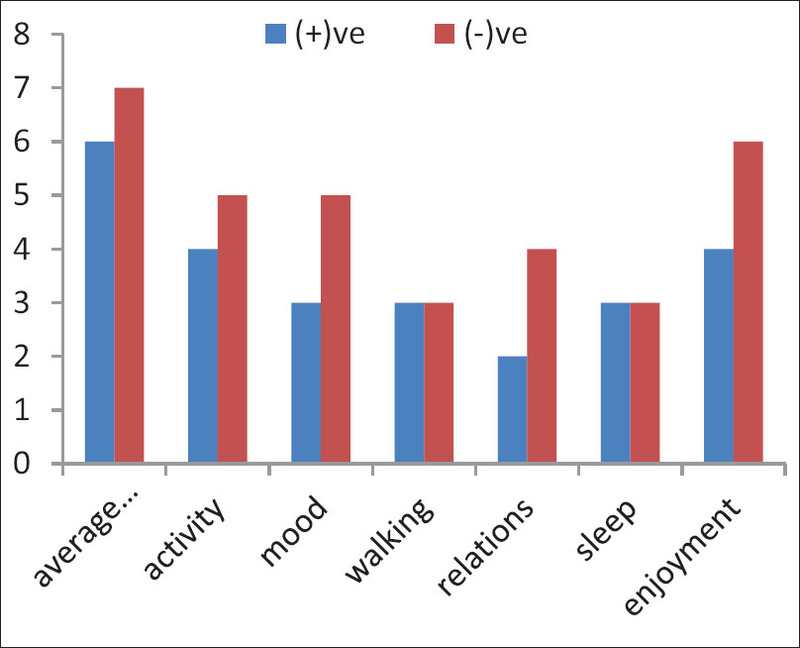 The overall success rate (VAS ≥ 50) was 80%. Remission of pain during the night was achieved in 100%, and knee flexibility was improved in 80%. The changes in the blood pool phase before RSV were 3.2 ± 0.7 and after the therapy 1.4 ± 0.7 (P < 0.001). The J/B ratio was: Before RSV 2.4 ± 0.3; after treatment 1.0 ± 0.2 (P < 0.05). CRP concentration 4 and 24 weeks after the therapy was significantly lower than before treatment. The fibrinogen level was not different before and after RSV. RSV side-effects assessed for the whole follow-up period were minor and not significant. RSV with 177 Lu-HA was safe and effective in patients with knee joint chronic painful synovitis of rheumatoid origin. It exhibited significant therapeutic effect after 6 months follow-up period with no significant side-effects. The preliminary investigations reveal that 177 Lu-labeled HA particles hold considerable promise as a cost-effective agent for RSV. More elaborate and controlled clinical trials are necessary to evaluate the therapeutic efficacy and safety of the agent compared with the treatment with other radionuclides and glucocorticosteroids. 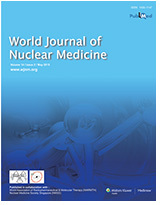 Routine work in nuclear medicine requires the careful elution of radioactivity and its subsequent, storage and handling. Though all effort is maintained to prevent any "spill" of this radioactivity, accidents are bound to happen. The response to this spill is a methodically worked out a plan that is written and adopted as a "standard operating procedure." This protocol is taught to all involved in the area of working as a mock drill/apprenticeship model. No formal evaluation of learning is in place except for the mock drills. The objectively structured assessment of technical skills (OSATS) is a variation on the Objective Structured Clinical Examination, which is a form of workplace based assessment. 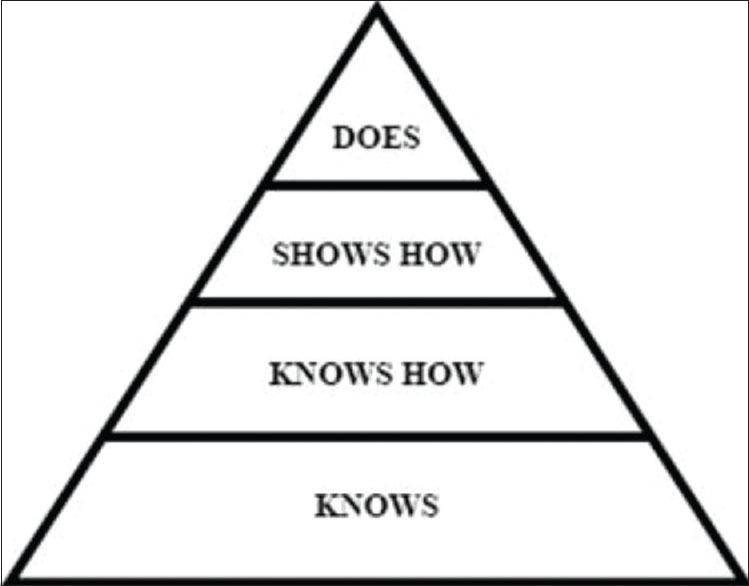 The OSATS is cited in the Accreditation Council of Graduate Medical Education evaluation toolbox on the website as the most desirable evaluation tool for the patient care topics. It is the objective of this paper is to introduce the "OSATS" for teaching, and assessment of the learning, of the protocol for the management of radioactive spill. As a review of the literature on the subject failed to reveal any such teaching protocol/material/document for this important technical skill, we hope that it may act as a landmark for the development of teaching and assessment of other technical skills also. For the treatment of skeletal metastasis, a therapeutic radionuclide tagged with a bone seeking ligand is required, while for radiation synovectomy (RS), a therapeutic radionuclide irreversibly attached to pre-formed particles of appropriate size is required. Radio lanthanides are mostly therapeutic, and ligands containing phosphate groups are predominantly bone seekers. Exploiting these facts, number of new therapeutic radiopharmaceuticals could be developed. Labeling of four phosphate containing materials was pursued in the present study. It was hypothesized that various 177 Lu-labeled bone-seeking complexes such as 177 Lu-ethylenediaminetetramethylene phosphonic acid (EDTMP), 177 Lu-methylene diphosphonate (MDP) and 177 Lu-pyrophosphate (PYP) could be developed as agents for palliative radiotherapy of bone pain due to skeletal metastases, and 177 Lu-Hydroxyapatite (HA) could be developed as an agent for radiosynovectomy of small joints. Lyophilized kit vials of EDTMP, MDP and sodium pyrophosphate (Na-PYP) were formulated. HA particles were synthesized locally and purity was checked by high-performance liquid chromatography (HPLC). 177 Lu was labeled with EDTMP, MDP, PYP, and HA and the behavior of all was studied by radio-thin layer chromatography (TLC) radio-HPLC and radio-electrophoresis. Radio-TLC confirmed the labeling. HPLC analysis too verified the labeling. Radio-electrophoresis results depicted peaks for 177 Lu-MDP, 177 Lu-EDTMP and 177 Lu-PYP at 3.37 ΁ 0.06 cm, 5.53 ΁ 0.15 cm and 7.03 ΁ 0.06 cm respectively confirming negative charge on each specie as all migrated toward positive anode. All 3 methods verified the labeling. The study demonstrated that EDTMP, MDP and PYP form stable complexes with 177 Lu in injectable solution form. HA particulates could too be labeled with 177 Lu with high radiochemical yields (>98%) in suspension form. Former three could be utilized as bone-pain palliation agents for the treatment of bone metastases, and the later could be applied for the treatment of Rheumatoid arthritis of small joints. The study has also indicated the possibility of developing other numerous radiolanthanide analogs with the potentials of possible use in radiation therapy. Several studies have reported on the expression of somatostatin receptors (SSTRs) in patients with differentiated thyroid cancer (DTC). The aim of this study was to evaluate the imaging abilities of a recently developed Technetium-99m labeled somatostatin analog, 99m Tc-Hynic-TOC, in terms of precise localization of the disease. The study population consisted of 28 patients (16 men, 12 women; age range: 39-72 years) with histologically confirmed DTC, who presented with recurrent or persistent disease as indicated by elevated serum thyroglobulin (Tg) levels after initial treatment (serum Tg > 10 ng/ml off T4 suppression for 4-6 weeks). All patients were negative on the Iodine-131 posttherapy whole-body scans. Fluorine-18 fluorodeoxyglucose positron emission tomography ( 18 F-FDG PET) was performed in all patients. SSTR scintigraphy was true positive in 23 cases (82.1%), true negative in two cases (7.1%) and false negative in three cases (10.7%) which resulted in a sensitivity of 88.46%, specificity of 100% and an accuracy of 89.2%. Sensitivity of 99m Tc-Hynic-TOC scan was higher (93.7%) for patients with advanced stages, that is stages III and IV. 18 F-FDG showed a sensitivity of 93.7%, a specificity of 50% and an accuracy of 89.3%. 18 F-FDG PET was found to be more sensitive, with lower specificity due to false positive results in 2 patients. Analysis on a lesion basis demonstrated substantial agreement between the two imaging techniques with a Cohen's kappa of 0.66. Scintigraphy with 99m Tc-Hynic-TOC might be a promising tool for treatment planning; it is easy to perform and showed sufficient accuracy for localization diagnostics in thyroid cancer patients with recurrent or metastatic disease. 177 Lu-ethylenediaminetetramethylene phosphonic acid (EDTMP) is presently suggested as an excellent bone seeking radionuclide for developing metastatic bone pain (MBP) palliation agent owing to its suitable nuclear decay characteristics. To find the exact dosage and its efficiency, this clinical study was performed on the human being, using 177 Lu-EDTMP for MBP palliation. 177 Lu-EDTMP was prepared by Iran, atomic energy organization. 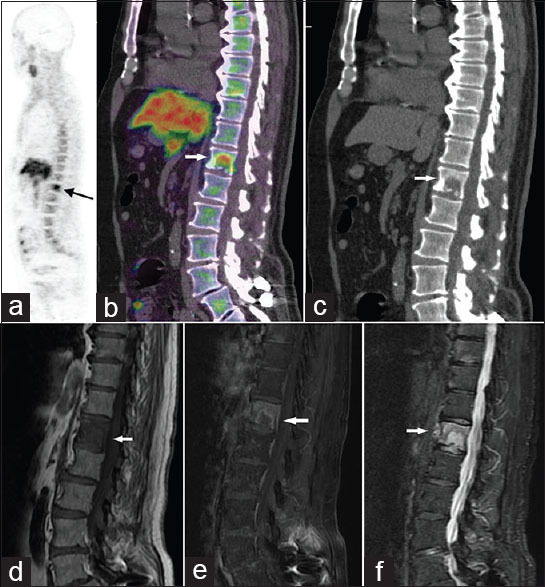 Thirty consecutive patients with determined tumors, incontrollable MBP, and positive bone scan at 4 weeks before the beginning of the study participated in this study in the nuclear medicine ward. 177 Lu-EDTMP in the form of sterile slow IV injection was administered with a dose of 29.6 MBq/kg. Short form of brief pain inventory questionnaire was used to evaluate the efficiency of the intervention. Questionnaires were filled out by an expert nuclear physician every 2 weeks while the cell blood count was also checked every 2 weeks up to 12 weeks for evaluation of bone marrow suppression and hematological toxicity. Furthermore, whole body scan was done at days 1, 3, and 7. Twenty-five patients showed a significant pain relief since 2 weeks after the injection, and continued until the end of the follow up period (12 weeks). There were no significant early complications such as bone marrow suppression, hematological toxicity, and no systemic adverse effects. No complication was observed in renal function. Twenty one patients showed flare phenomenon that was started after the 12.2 ± 1.78 h lasting for 38.4 ± 23.08. Sixteen patients (53%) were completely treated; nine patients (30%) showed a partial response, and five patients (17%) had no response to treatment. Total response to treatment was achieved in 25 patients (83%). At the end of the evaluation, no bone marrow suppression or hematologic toxicity was observed. 177 Lu-EDTMP has shown suitable physical and biological properties with good results in long term bone pain relief for patients with bone metastasis. Glomerular filtration rate (GFR) estimation by plasma sampling method is considered as the gold standard. However, this method is not widely used because the complex technique and cumbersome calculations coupled with the lack of availability of user-friendly software. The routinely used Serum Creatinine method (SrCrM) of GFR estimation also requires the use of online calculators which cannot be used without internet access. We have developed user-friendly software "GFR estimation software" which gives the options to estimate GFR by plasma sampling method as well as SrCrM. We have used Microsoft Windows; as operating system and Visual Basic 6.0 as the front end and Microsoft Access; as database tool to develop this software. 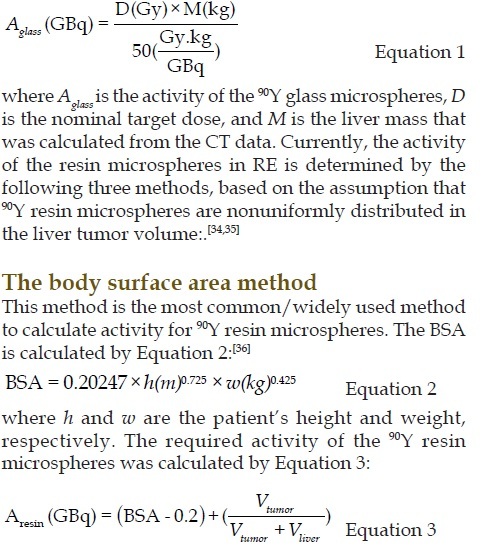 We have used Russell's formula for GFR calculation by plasma sampling method. GFR calculations using serum creatinine have been done using MIRD, Cockcroft-Gault method, Schwartz method, and Counahan-Barratt methods. The developed software is performing mathematical calculations correctly and is user-friendly. 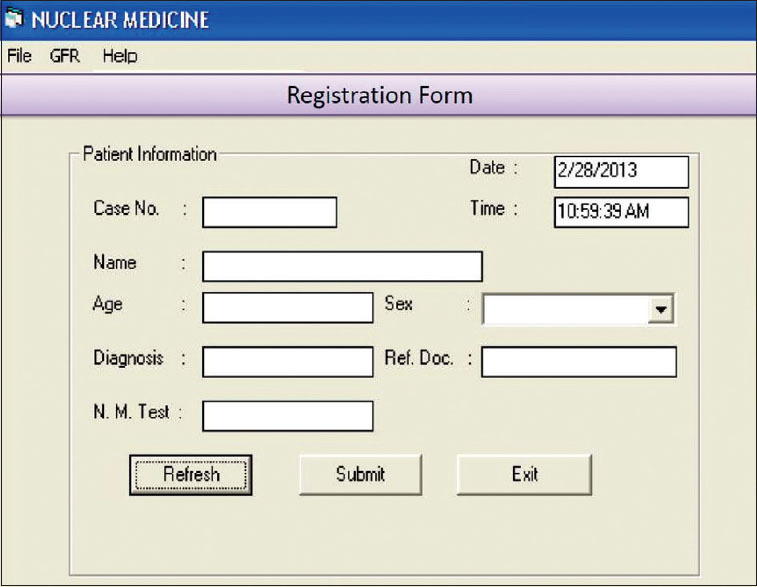 This software also enables storage and easy retrieval of the raw data, patient's information and calculated GFR for further processing and comparison. This is user-friendly software to calculate the GFR by various plasma sampling method and blood parameter. This software is also a good system for storing the raw and processed data for future analysis. Thyroid scintigraphy plays an important role in the anatomical and functional evaluation of thyroid nodules which carry the risk of malignancy. The presence of multiple nodules carries overall smaller risk of cancer than solitary nodule. Missing nodules, whether solitary or multiple, may mean delaying detection of possible cancer. Therefore, it is important to improve the delectability of thyroid scintigraphy using most optimal imaging techniques. For pinhole thyroid imaging, there is a recent trend to omit oblique projections by some laboratories. The objective of this study was to reevaluate the impact of oblique projections in the detection of thyroid nodules. A total of 92 cases with nodular thyroid disease on routine pinhole thyroid scintigraphy was reviewed retrospectively. Two nuclear medicine physicians recorded the number of nodules based on the anterior view only and another time with adding the oblique views. A total of 192 nodules was detected using the three views. Sixty nodules (31%) were only seen on the oblique views and were missed on the anterior projections. Oblique pinhole projections are mandatory for adequate thyroid scintigraphy since 31% of nodules are missed if only anterior projection was used for interpretation. Following proper techniques will avoid missing of detection of nodule that may harbor cancer. Primary retroperitoneal seminoma is a very rare entity. We present a case of 39-year-old male with primary retroperitoneal seminoma with staging and surveillance by means of F-18 fluoro-2-deoxyglucose-positron emission tomography/computed tomography (FDG-PET/CT). 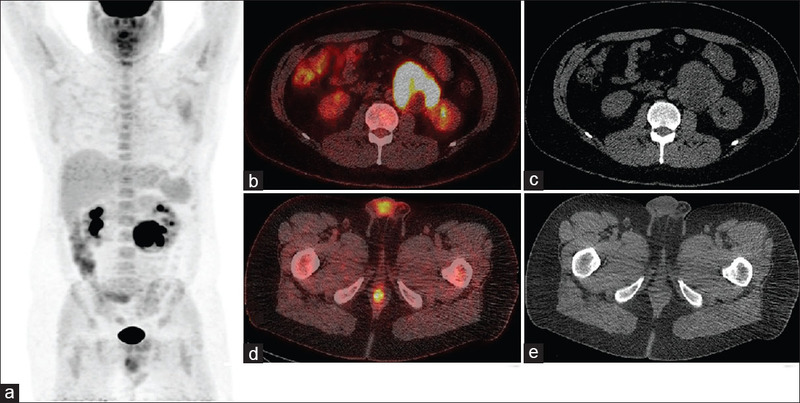 The case demonstrates that primary retroperitoneal seminoma can be easy to identify with FDG-PET/CT and potential follow-up on recurrence, or metastatic disease can be performed using this technique. Endometriosis is a frequent and clinically relevant problem in young women. 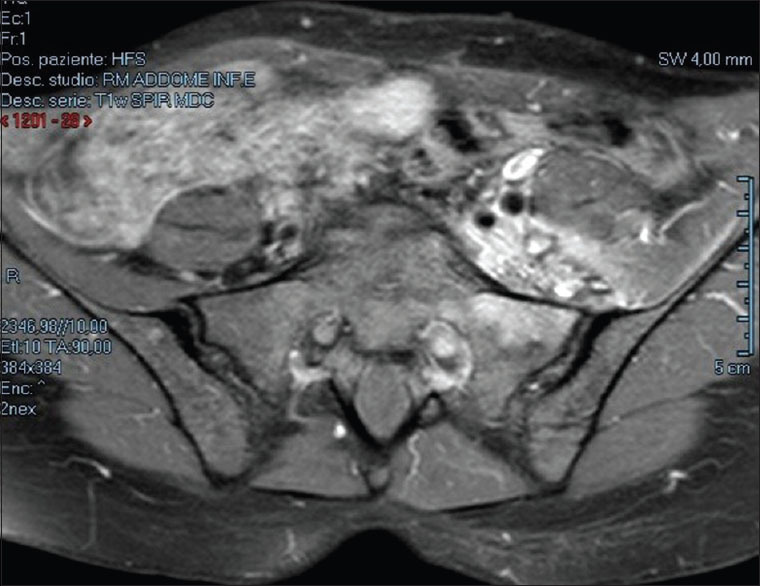 Laparoscopy is still the gold standard for the diagnosis of endometriosis, but frequently both morphologic and functional imaging techniques are involved in the diagnostic course before achieving a conclusive diagnosis. We present a case of a patient affected by infiltrating retroperitoneal endometriosis falsely interpreted as a malignant mass by contrast-enhanced magnetic resonance imaging and 18 F-fluorodeoxyglucose positron emission tomography/computed tomography. Neuroendocrine tumors (NETs) account for 8-10% of cases of carcinomas of unknown primary. Most of these cases are poorly differentiated with metastatic disease at the time of diagnosis. However, cutaneous metastatic presentation is rare. We present an interesting case of a 74-year-old woman presenting with cutaneous metastatic involvement from high grade poorly differentiated NET of unknown origin. She was referred to us with a diagnosis of lymphoma. 18-F-fluorodeoxyglucose positron emission tomography/computer assisted tomography imaging at our institution offered a differential diagnosis, including neuroendocrine cancer. Repeat skin lesion biopsy demonstrated "non-Merkel cell" carcinoma, favoring metastatic high-grade neuroendocrine carcinoma. 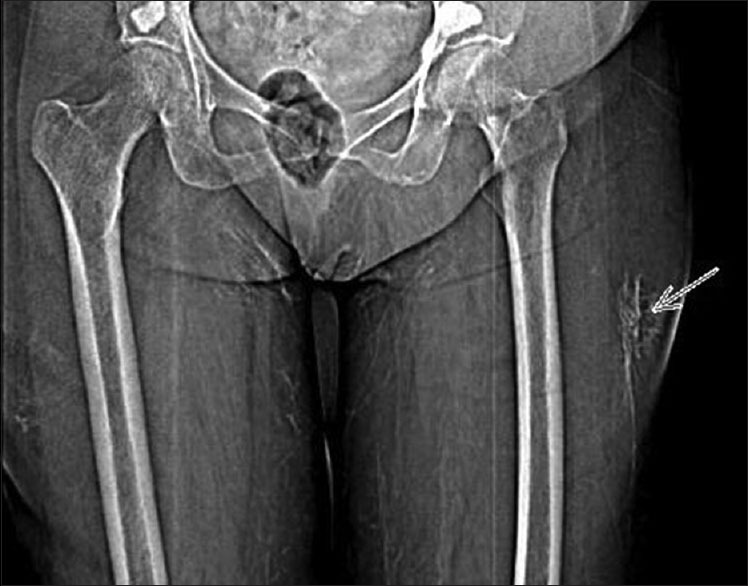 Tumoral calcinosis (TC) is an uncommon ectopic calcification syndrome. TC is a benign condition characterized by the presence of large calcific soft tissue deposits occurring predominantly in a periarticular location. It generally occurs as a complication of renal dialysis or trauma, and is rarely seen in familial and sporadic cases. Bone scintigraphy is a sensitive method for diagnosing TC. We report a case of year old female with. She underwent bone scintigraphy to see the sites of involvement, which showed intense foci of tracer activity in soft tissue in bilateral thigh and gluteal region. Hybrid single-photon emission computed tomography/computed tomography of the pelvis and thigh localized tracer uptake to the calcification in the gluteal and thigh region. Bone metastasis in prostate cancer are detected by choline positron emission tomography/computed tomography (PET/CT) with high sensitivity and specificity. 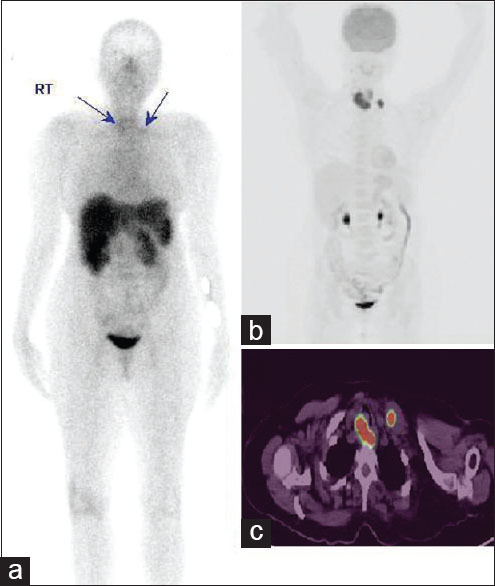 We report the case of a patient with previous prostatectomy for prostate cancer who underwent F-choline PET/CT for a recent increased of prostate-specific antigen value and showed focal vertebral uptake suggestive for skeletal metastasis; magnetic resonance imaging revealed unexpectedly a Schmorl's node (SN). False positives on choline PET-CT caused by SN has not be reported in the literature and the present case highlights that this possibility should be considered in case of choline vertebral increased uptake in the patient with prostate cancer.